On Mar. 5, an European Space Agency (ESA) delegation headed by Franco Ongaro, Director of Technical and Quality Management, visited NSSC. Professor LIU Bo, Deputy Secretary General of Coordination Committee for International Cooperation, Chinese National Space Administration (CNSA), accompanied the ESA Delegation for this visit. In the briefing meeting, Professor WU Ji, Director General of National Space Science Center (NSSC), Chinese Academy of Sciences, welcomed the ESA delegation and expressed his personal expectation for the delegation. Dr. Franco Ongaro introduced the members of the ESA delegation and commented on the history of ESA-China cooperation. Professor WANG Chi introduced NSSC briefly and Professor WU Ji made an introduction of the Strategic Pioneer Program on Space Science with the emphasis of the projects participated by ESA, which is followed by a report by Professor LIU Hao on the Geosounder Cooperation with ESA. The delegation visited NSSC facilities after the meeting. 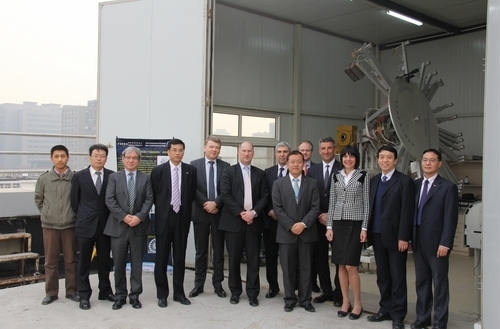 The guests were invited to see the Key Lab of Microwave Remote Sensing, Lab of Space Exploration Technology Research, Data Center of Meridian Project, the Concurrent Design Center of Lab of Space Information Simulation Technology Research and the Geosounder facilities. Both parties recalled the long cooperation history and expressed keen interests in bilateral cooperation in the future.